GettyWalmart failed to keep some basic items in stock over the holiday period. Walmart’s online sales grew by 23% in the most recent quarter, down from 50% growth in the previous period. The company said it failed to keep some basic items in stock over the holidays as it tried to manage a higher demand for things like TVs and toys. Walmart’s shares slid more than 10% on Tuesday, marking its worst stock performance since January 1988. Walmart’s online sales growth sharply slowed over the holidays, falling to 23% growth from 50% in the previous quarter, the company said Tuesday. But some of it was because of operational issues. Walmart failed to keep some basic items in stock during peak sales periods, McMillon said on a call with analysts on Tuesday. 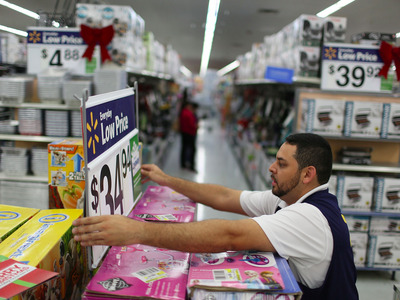 Walmart had to stock more items in its warehouses like toys, TVs, and other electronics, which are in high demand during the holiday period, he explained. In-stock levels on other items were “harmed” as a result, he said. “We’re learning how to deal with higher volumes,” McMillon said. Though demand exceeding expectations is a good sign for the business, Walmart’s inability to respond is concerning, especially as it increasingly contends with Amazon in the retail arena. Walmart assured investors that it would eventually fix the problem, saying it expects online sales growth to bounce back to 40% in the next year. “We’re not expecting the first quarter to go all the way to 40%” growth, McMillon said, but to ramp up gradually over the next four quarters and reach an average of 40% for fiscal 2019. Overall, Walmart’s revenue in the most recent quarter grew by 4.1%, to $US136.3 billion. Same-store sales at its US stores rose by 2.6%, driven by a 1.6% increase in shopper traffic.